There are generally two types of dating apps – those that allow you to chat your match up once you receive a mutual like, and those that don’t allow you to chat them up. Most dating apps fall under the first category – such as Tinder, Paktor, Coffee Meets Bagel, and many others. For Singapore based LunchClick, it falls under the second one. The only way to chat with your match is only when you meet up with him or her. Unfamiliar with LunchClick? The dating app sends you one match a day at noon, and if you receive a mutual like, you can then send questions (which are preloaded on the app) to your match to find out more about him or her. If you are happy with the responses from your match, you can then ask her out for a date (or agree to a date request). 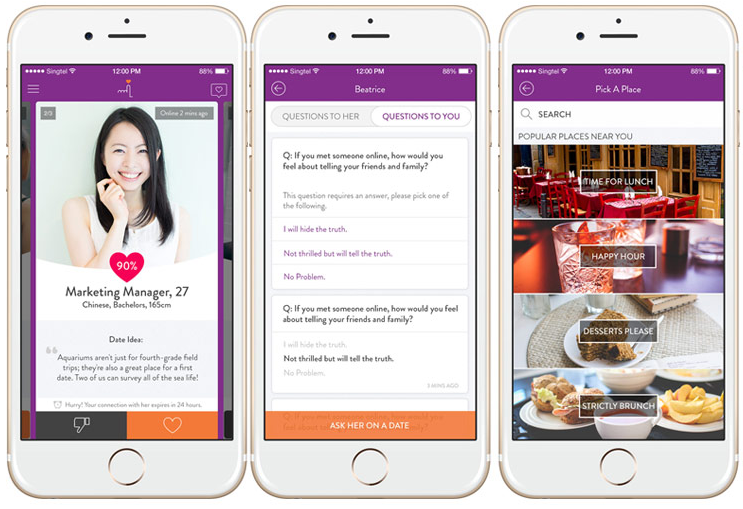 Since its launch a year ago, LunchClick has amassed a huge trove of data based on the responses from its user, and has shared some insights into the minds of single ladies in Singapore. These responses are from a random anonymous sample pool of 200 female users on LunchClick. Height is apparently a very big deal – 75% of the female respondents are unlikely or very unlikely to date someone who is shorter. Age is not such a big deal – 53% of the female respondents are neutral towards dating a guy who is younger. very unlikely” when ask if they will date someone who is earning lesser. Almost 1 on 2 girls (46%) thinks the boyfriend should propose in 1 – 2 years. Wow. In less than 6 months after you are in a relationship, 60% of the girls thinks they should meet the boyfriend’s friends, and 50% of the girls thinks they should meet the parents in 0.5 – 1 year. 67% of the respondents prefer to meet their boyfriend 2-3 times per week. None of the respondents want to meet 6 – 7 times per week. 78% of the respondent think kissing is cheating. To the other 22%, how is that not cheating? Would it bother you if your date looks different (facial features) from his/her online pictures? Would it bother you if your date is heavier than suggested in his/her online pictures? How likely will you date someone who is shorter? How likely will you date someone who is earning lesser? How likely will you date someone who is younger? Will you date someone who is of a different nationality? Will you date someone who is of a different racial group? How long should your boyfriend take to propose to you? After how long would you like to meet his parents? After how long would you like to meet his friends? How often would you like to meet your boyfriend in a week? Do you care about the number of exes your boyfriend has? Would you forgive your boyfriend if he cheated on you? Would you like your boyfriend to buy things for you? Dating App Coffee Meets Bagel Wants To Send You For An All Expense Paid Date With American Celebs!